This section it is, to my opinion, the "core" of the whole page and it is dedicated to the creation of original effects with bubbles and their "inventor". I will try to list here almost all effects that can be intended as original of some performers and, therefore not intended to copy. Part a database for to protect the intellectual work and their creator, part an inspiring source for to help upcoming bubble performers to be innovative. I will not list here an effect or a tool if I'm not 100% sure of his inventor, there is also the reason why some effects do not appear here. The list will be updated, hopefully, with time and in any moment I will find a new source or receive information from other performers. The list, also, is not intended in order of importance or chronological. I open this section with one of the most popular bubble tool, still used today by an "army" of bubble performer. On the left side you can watch what can be considered the real first picture of the tool in action. Day of discovery 12/1986. Although I had come up with the idea for the tristring a month earlier after visiting the Exploratorium in San Francisco, this was the day I put one together and tried it. This was not the 1st bubble but close to it. Friends where gathered at my studio in Key West for an after work drink, I didn't say a word about it. I just pulled it out and made this bubble. Kalvin patented the tool that was later produced by an international toy company and sold all around the world with the name "Dip Stix", a picture of which you can see below. Later the patent expired and the tool was suddenly copied around all the world and it is still produced today by different toy producer. I think that it should be correct, at least, to relate it to his first inventor. 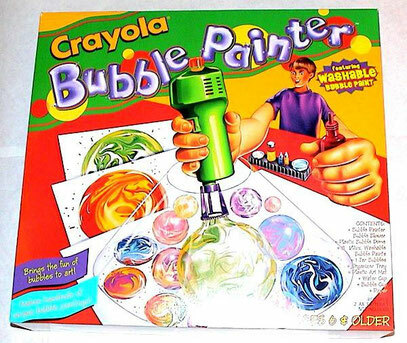 Kalvin produced also other interesting and original bubble toys, his second creation was "The Foamie", also sold from different toys company later. You can see a pictures from the advertising on the left. Kalvin shared with me the project of this tool, I will ad below in a small gallery of pictures, so if somebody may be interested in to produce for his personal use here it is possible to find details. 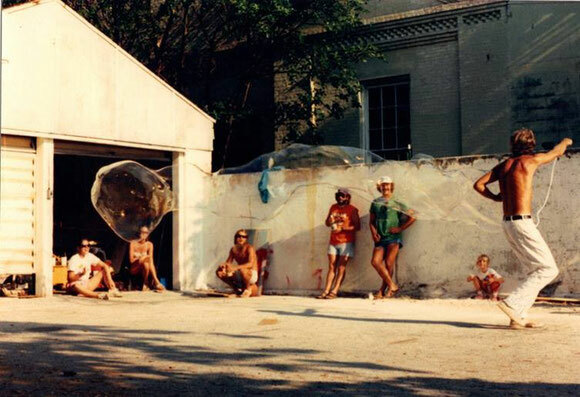 "In 1992 I designed this toy project to combine art and bubbles. I later licensed the concept to Crayola and it was on the market in 95- 98. The original concept used a device that blew a bubble then released two different colors of a watercolor paint onto its surface. The paint flowed down the valleys in the surface of the bubble blending the two colors and the user then pressed the bubble onto a sheet of paper. Crayola opted to use a simpler design because of their core customers age." 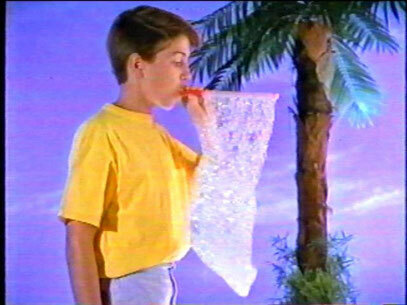 One more product created and also sold by toys company it is The bubble Twister. 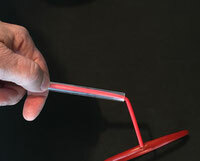 here a close details of the Bubble Twister, you can see that it may be very easy to reproduce. Enjoy this gift and experiment with it. Recently I have seen a picture of it connected to a small battery operated drill; this addition make it very funny to watch and, perhaps, much easier to perform.